During the 'Big Fun Week Off Work 2016' I found myself, yet again, in Waterstones and clutching books from their always-dangerous 'Buy One Get One 1/2 Price' deal. 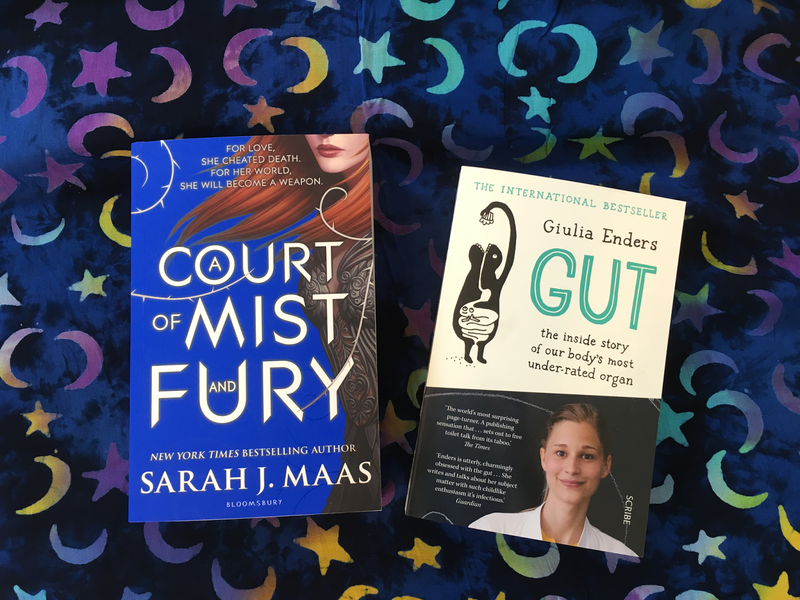 The first book I picked up was Gut: The Inside Story of Our Body's Most Under-Rated Organ by Giulia Enders (translated from German by David Shaw, published in English by Scribe), which has been on my radar for a few months now. Filled with drawings and lots of interesting information on your digestive system, this looks like it will be a quick but revealing read. My half price book of choice was A Court of Mist and Fury (published in 2016 by Bloomsbury), the sequel to Sarah J. Maas' A Court of Thorns and Roses which I reviewed in my Quick Reviews post earlier in the week. I was really pleased to see that this is about double the size of the previous volume with oddly tiny text. Think of the amount of drama that can fit in those pages. From everything I have read about this series, this second book has had an even more positive reception that the first so I am excited. P.S. The moon and stars blanket is new too and will probably be featured in every photo on my blog from now until the end of time.